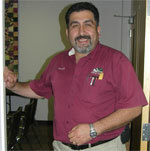 Fernando Barrientos has 30 years of experience in the construction industry as an electrician. He performs home inspections throughout Northern Virginia. As a member of the American Society of Home Inspectors Fernando performs home inspections according to the highest stanard. Fernando Barrientos is an excellent home inspector and a trusted colleague. I have known Fernando for years through our mutual participation in the Northern Virginia Chapter of the American Society of Home Inspectors (NOVA ASHI) and have always been impressed with his integrity and sincerity. I enthusiastically recommend Fernando without hesitation.